I have been working on some big changes to Shapesmith that makes it vastly more usable to create and edit models - the introduction of a workplane. 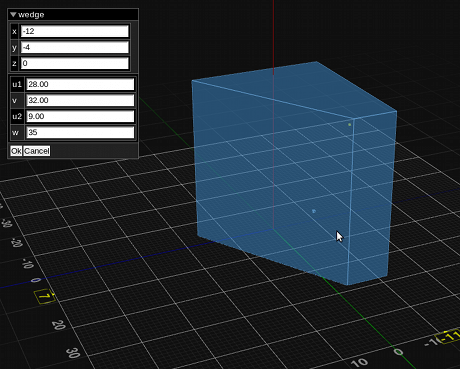 The workplane will be the basis for mouse interaction when creating primitives, doing transformations etc. The workplane is centered at (0,0,0) at the moment, with no ability to move it around, but that's coming. 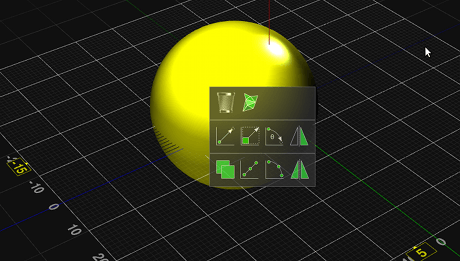 To rotate the workplane around, a user can drag the view with the left mouse button. Scrolling is done with the mouse wheel (I just realised that I should also support scrolling for trackpads). When satisfied, clicking on the “Ok” button will create the primitive, and clicking “Cancel” or pressing “Esc” on the keyboard will cancel the operation. For boolean operations, 2 objects should be selected, then again right-click or left-click-and-hold to show the menu for multiple objects. Left-click dragging will rotate the view. The mouse wheel will zoom in and out. Left-clicking selects an object. Shift + left-clicking selects multiple objects. The toolbar is selection-sensitive, so depending on whether 0, 1 or 2 objects are selected it will offer different options. Right-clicking or left-click-and-hold pops up the toolbar for primitive creating, transforms, booleans etc.